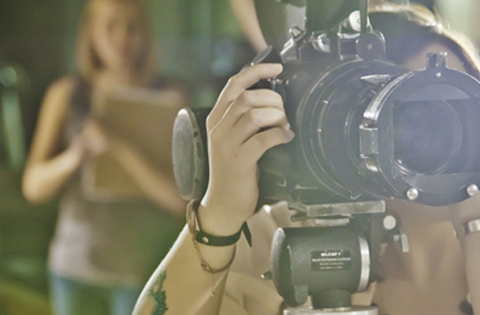 Offering degrees in Animation , Film + Animation , Film + Video , Film Design + Production , and Photo + Film Media , the School of Film provides an interrelated curriculum that combines intensive practical experience with a broad understanding of these programs within historical, theoretical, aesthetic, and cultural contexts. While emphasizing independent creative work that expresses personal vision, we also value collaboration, and our students typically work with majors from disciplines across the University, including music composition, acting, dance, design, photography, and crafts. The faculty is committed to encouraging students to widen their perspectives, to become flexible and innovative learners, to discover and nurture their unique voices, and to master at least one of the complex art forms that we teach. We ensure that our graduates leave the University with a sophisticated knowledge of their chosen medium and a more profound sense of themselves as artists. With study abroad and internship opportunities, courses in professional practices, and visits from industry experts and independent artists, we prepare our students to successfully enter exciting, yet demanding fields.